Apple’s new iCloud service allows you to sync calendar Events and To Dos on your Mac with an iOS device through icloud.com. 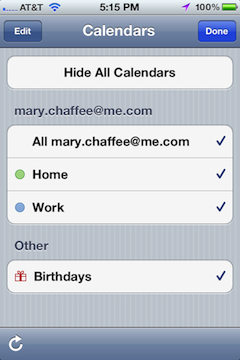 One of the big changes in iCloud vs. its predecessor, MobileMe, is that iCloud calendars are type-specific. Each iCloud calendar may contain either Events or To Dos, but not both. When you upgrade to iCloud, each of your existing calendars will be split into two calendars — one for Events and one for To Dos. This has caused some confusion for long-time users of iCal and BusyCal, especially since the To Do calendars in iCal are well hidden. 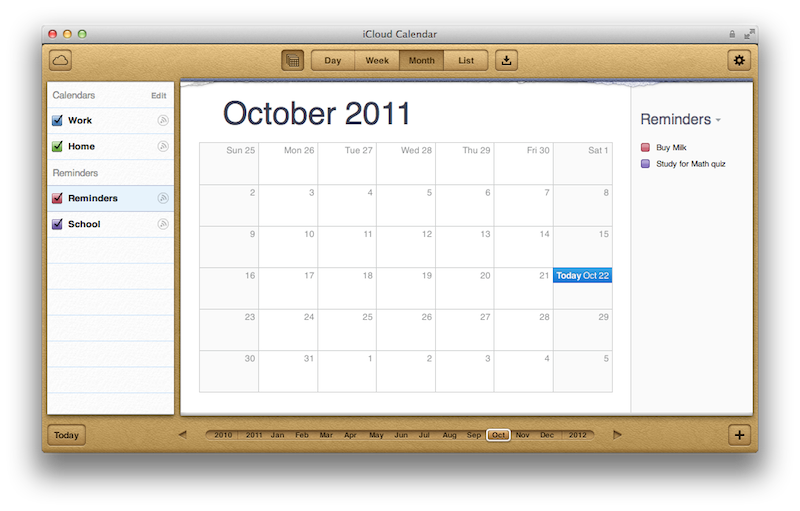 Here’s an overview of how the Event and To Do calendars are displayed on iCloud, OS X, and iOS. When viewing your calendar on icloud.com, the Event calendars and the To Do calendars are listed in the left sidebar in separate groups named Calendars and Reminders. In iCal, the Event calendars are listed under the Calendars button on the left, and the To Do calendars are listed under the Reminders popup menu on the right. iCal's UI is somewhat confusing. The Calendars button implies that clicking on it will expose controls for filtering calendars, but that’s not what is expected of the Reminders popup menu. 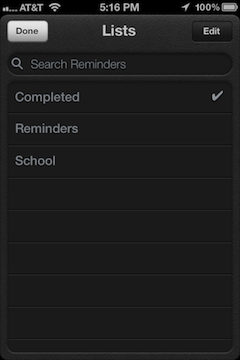 Very few users are aware that a list of To Do calendars are displayed under the Reminders popup menu. What’s more, it’s inconsistent with iCloud and BusyCal where the popup menu above the To Do List displays a list of sorting options, which used to be the behavior in earlier versions of iCal. The situation on iOS is less confusing because the built-in apps are type specific. 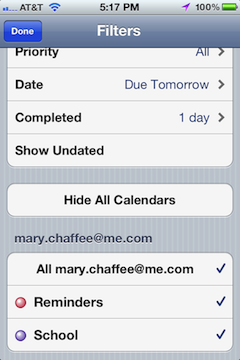 Likewise, BusyToDo syncs only with the To Do calendars on iCloud. In summary, iCloud stores Events and To Dos on separate calendars. 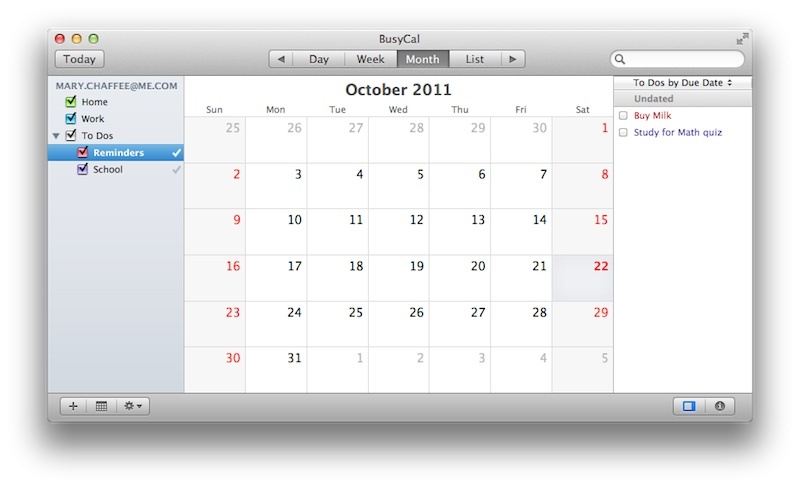 BusyCal and iCloud display the To Do calendars in the left sidebar. 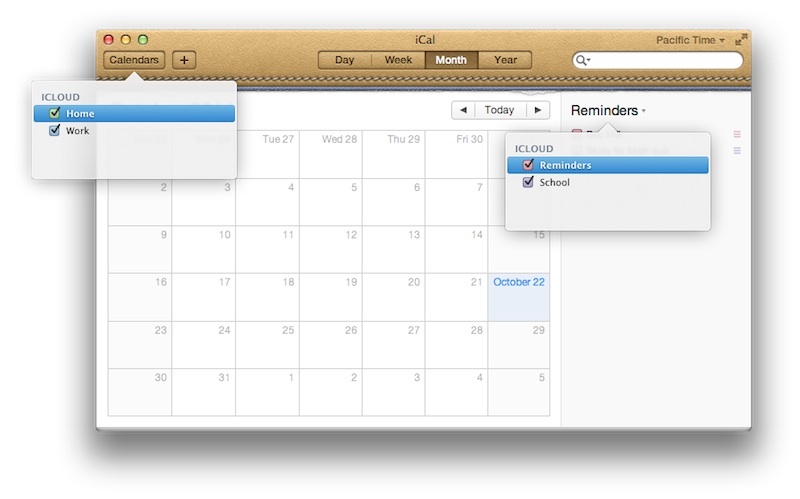 iCal hides the To Do calendars under the Reminder popup menu on the right.